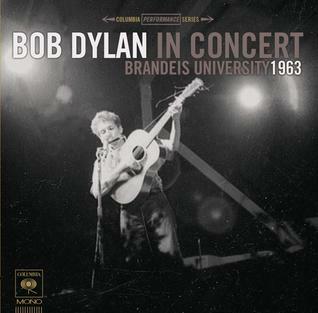 A tape of a Bob Dylan concert performed on May 10, 1963 at Brandeis University was found among the belongings of Rolling Stone co-founder Ralph Gleason and the quality was good enough for Columbia to release it as an album. In a few months The Freewheelin' Bob Dylan LP would be released and propel Dylan to fame. A wonderful historical artifact, the record provides insight into Dylan's early performing style, specifically, his blending of humorous and serious material. The first side begins with "Honey, Just Allow Me One More Chance," which would appear on the Freewheelin' LP. "Talkin' John Birch Paranoid Blues" was performed much to the college crowd's amusement, a song Dylan planned to perform on The Ed Sullivan Show but walked off when the CBS requested a less controversial song. The Midwest Gothic "Ballad of Hollis Brown" followed. The first set closed with the stunning "Masters of War." The second set features Cold War themed "Talkin' World War III Blues,", the introspective "Bob Dylan's Dream," and the comical "Talkin' Bear Mountain Picnic Massacre Blues." With Dylan about to reach a national audience, the set featured his early folk influences and newer compositions that addressed contemporary concerns. Some of those early concerts are obvious that the dude was talented. But Brandeis makes me wonder if I would've heard it if I were in the audience. I hope more tapes appear as time goes by.